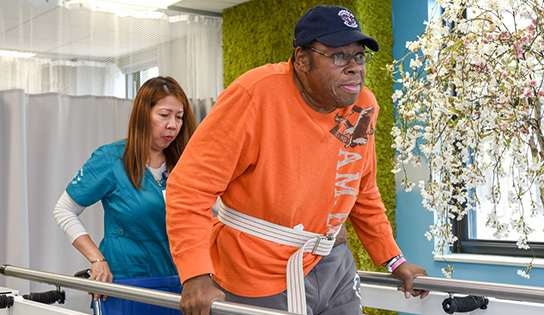 Mr. E. Macdonald came to Cortlandt Healthcare in mid-May seeking rehabilitation services after recent difficulties that led him to Hudson Valley Hospital Center. After given choices of where he would like to get therapy from, Mr. Macdonald and his family chose to come to Cortlandt Healthcare! Upon arrival, Mr. Macdonald was greeted by all disciplines of staff members from nursing, therapy, and social services. Mr. Macdonald was also welcomed by his very own concierge to help him feel more confident during his stay. During Mr. Macdonald’s initial days at Cortlandt Healthcare, he was evaluated by the rehabilitation team, and together determined short and long-term goals to achieve during his stay. Some of the goals that were made included the increase in standing with appropriate balance, being able to confidently perform ADL’s (Activities for Daily Living), being able to walk over a certain distance, and lastly be able to go up and down the stairs with good balance. In order to achieve these goals, it was determined that Mr. Macdonald would get his rehabilitation sessions six days a week for the length of his stay. Continuing his exercises, Mr. Macdonald’s next goal was the stairs. Initially, he was only able to negotiate two, five-inch steps with both hands on the handrail. Over the next couple of weeks, Mr. Macdonald was able to overcome five steps, then ten steps, and then finally graduated with being able to negotiate 16 steps with little support from the handrail! Lastly, Mr. Macdonald was reevaluated for his balance and overall strength. At first, he scored 10 out of 28, but shortly after getting motivated and eager to get stronger, he gained a score of 18 out of 28, and graduated with a score of 26 out of 28! Mr. Macdonald successfully completed and concurred with all of the goals he and the rehabilitation team initially set!